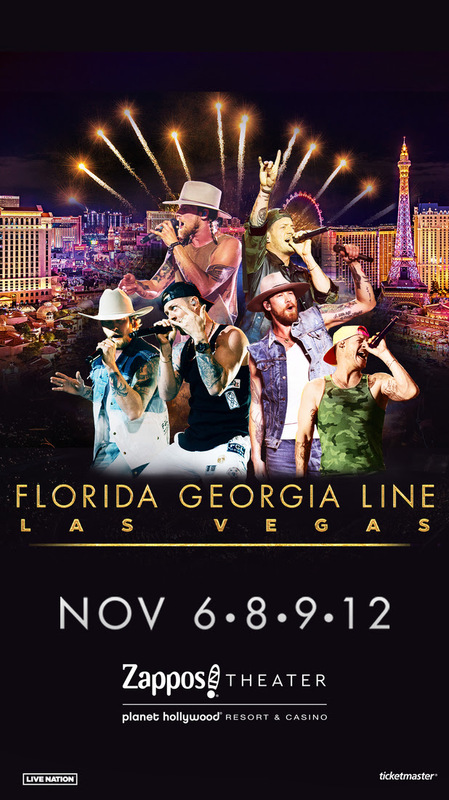 LAS VEGAS, NV (April 4, 2019) — Following the massive success of their Las Vegas shows in December 2018, GRAMMY® nominated world-class entertainers FLORIDA GEORGIA LINE will return to the Vegas Strip with their limited residency, FLORIDA GEORGIA LINE LIVE FROM LAS VEGAS inside Zappos Theater at Planet Hollywood Resort & Casino on November 6, 8, 9 and 12, as exclusively announced by People today. Tickets for FLORIDA GEORGIA LINE LIVE FROM LAS VEGAS will go on sale to the public Friday, April 12 at 10 a.m. PT. General ticket prices begin at $39, plus applicable tax and fees, and may be purchased online at ticketmaster.com or in-person at the Planet Hollywood box office. All shows begin at 8 p.m.
FGL’s fan club community, FGL Lifers, have first access to a presale beginning Monday, April 8 at 10 a.m. PT through Thursday, April 11 at 10 p.m. PT. Citi is the official presale credit card for the FLORIDA GEORGIA LINE LIVE FROM LAS VEGAS residency. As such, Citi cardmembers will have access to purchase presale tickets beginning Tuesday, April 9 at 10 a.m. PT until Thursday, April 11 at 10 p.m. PT through Citi Entertainment. For complete presale details visit www.citientertainment.com. In addition, Total Rewards members, Caesars Entertainment’s loyalty program, Live Nation, and Ticketmaster customers will have access to a presale running Wednesday, April 10 at 10 a.m. PT through Thursday, April 11 at 10 p.m. PT.